Google tests a service called Cloudboard, an online clipboard that should make it easy to copy data between Gmail, Google Docs and other Google services. The service is not publicly available yet, but there are many references to it. 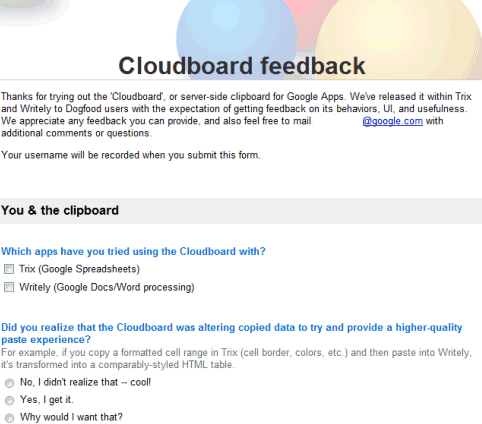 An internal feedback form (update: Google disabled the form) describes Cloudboard as a "server-side clipboard for Google Apps". Google provides an example of copying data from Google Spreadsheets to Google Docs: "if you copy a formatted cell range in Trix (cell border, colors, etc.) and then paste into Writely, it's transformed into a comparably-styled HTML table." Google's feedback form includes many other examples: pasting excerpts from Google Spreadsheets to Gmail, copying multiple images from Picasa Web Albums, copying YouTube videos, copying an event and pasting it into Google Docs or Gmail, pasting copied items from Google Image Search, copying maps into Google Docs etc. I've always thought that Google Notebook will be Google's web clipboard, but now that the service has been discontinued, Cloudboard will be the bridge between Google's services. Nice. Something everyone will use. I could use that for Gmail as well. Pasting a Google Spreadsheet array into Gmail creates a formatting disaster. I'm just waiting for Google to finally get their Spreadsheet App to be able to refer to cells in different files. This seems pretty obvious, and I don't understand why it isn't implemented yet. Without any Google Cloud just copy any web page and paste it into Google Docs. It's amazing ! If you do that with Microsoft Office it's a mess. Good. I had to export a google spreadsheet into html and then copy and paste it into a Google doc. It was a bit on the messy side. I look forward to this ability. This sounds a good idea, so far as it goes. * When copying from one page that contains a form to another, populate the second form with the corresponding data items from the first. * When copying from a form to a table (e.g. a spreadsheet), use the field names as column headings in the first row, and place the data values in the second row (essentially a database with only one data row). * When copying from a table to a form, reverse the process described above. For a form with, say, eight fields these conversions would reduce the effort of populating a form with data you already have by a factor of eight. finally, I waited for this! KISS: Bring back Notebook, slightly enhanced. Wanna see it available soon! Can't wait for a try!!! Finally it will be used in Google Wave as well as Gogole OS! Wow, copy and paste. Welcome to 1992. 1992? That's exactly right. In 1992 Microsoft's Windows for WorkGroups began to take off, with many inter application messaging, data binding and exchange features. DDE became OLE. Copy/Paste took rich capabilities of application specific formatting. The Microsoft Office editors moved to the center of an emerging Microsoft Productivity Platform/Environment with ecosystem bound features such as merging data from one application source into the documents of another. OLE enabled the creation of rich compound documents. A new highly "interactive" environment replaced the "static" interfaces of the past. This too was directly reflected in the kinds of interactive workgroup-workflow rich documents that came to dominate client/server business processes and systems. These business processes and systems in turn became infinitely entangled and bound to the Microsoft Productivity Environment. A monopoly was born. And Microsoft owned the platform. Today the Web has become the platform where a new unified productivity environment is emerging. All of the elements of that 1992 Productivity Environment are finding a Web for Workgroups expression, with Google providing more than it's fare share of components, core applications and inter application services. One of the interesting things that happened in 1992 was that as the inter applications services and components evolved, contact/project/pim management applications moved into the center of the productivity environments. MSOffice editors were pushed aside, as the convergence of communications, content, scheduling, contact and project management became the "point of assembly" for business processes. For example, a merged document might begin in MSWord with formatted content and inserted merge fields drawing on both contact management databases and divisional transaction processing databases. The important point however is that the contact management applications took hold of the center. Which is why Microsoft had to introduce OutLook. (continued....) It's the combination of Google Wave-Voice-Apps that provides the core applications needed to challenge Microsoft's attempt to move the legacy productivity environment to a proprietary MS-Web center. But Google also has to provision interoperable productivity layers that enable rich inter application connectivity. Microsoft 2010 has a full alignment of proprietary MS_Web ready formats, protocols and interfaces wrapped in the .NET-WPF framework. They have the advantage of being in position to migrate and transition to this MS-Web a near 100% monopoly of legacy business systems bound to the MSOffice Productivity Environment. The entire MSOffice Productivity Environment itself has undergone extensive re-purposing to integrate into the Exchange/SharePoint/SQL Server juggernaut. The transition will be costly, but not as disruptive as trying to move these business systems to the Open Web. Or so Microsoft hopes. I believe that Google can succeed in capturing much of the monopolist's legacy of client side business systems. But to do so they need to re-purpose the MSOffice Productivity Environment also, but to the Open Web. For businesses the cost of disruption far outweighs the cost of technology and systems re-engineering. But think about the internal mechanisms that Google must have in place before they can begin to challenge Microsoft's attempt to move the legacy Productivity Environment? Cloudbook is just the tip of the iceberg. At the end of the day though, i really think the Open Web convergence of communications and content exemplified by the combination of Wave and Voice will trump the MS-Web desktop to server advantages. And not just because the technology makes possible a productivity jump far beyond the 1992 contact manager boost. There is an underlying issue for Microsoft that they've refused to resolve, and has become increasingly important to end users; the sovereignty of information systems and ownership of content. The thing is that Microsoft applications are designed to "own" the content, data and communications fundamental to an interactive digital process or system. It's not just the end users information that gets bound to Microsoft applications and platform ecosystems. It's their business processes and systems bindings that eliminate competitive choices across the entire spectrum of computer services. The Open Web promises end users a sovereignty of systems and uncompromised ownership of information. The essence of this promise however is in the separation of applications and platform components from information. That means open standards and interoperable implementation models. It also means Google can not do this alone. Apple, Cisco, Yahoo, SalesForce.com, Oracle, Apache, Mozilla, Opera, Nokia, Red Hat and Ubuntu need to quit the squabbling, grab an oar, and start pulling in the same direction. HTML5, Wave, Voice and WebKit matter. @anonymous yeah, it surprised me too that Google Spreadsheets = Trix. Apparently Google acquired it or something (go figure!) and just changed the name.